When Sue Canterbury, the Pauline Gill Sullivan Associate Curator of American Art at the Dallas Museum of Art (DMA), noticed a striking painting at a collector’s home, she was surprised to learn the painter was Ida O’Keeffe, the sister of iconic artist Georgia O’Keeffe. 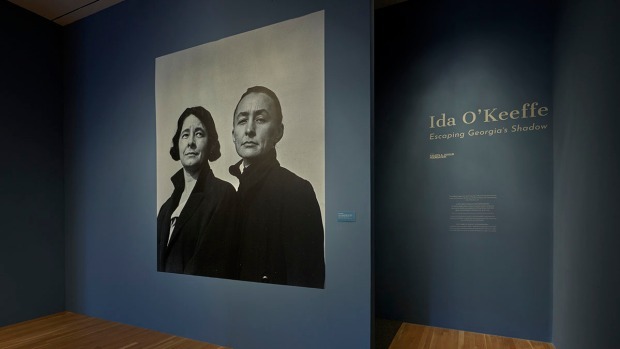 More than four years of Canterbury’s in-depth research resulted in “Ida O’Keeffe: Escaping Georgia’s Shadow,” on display at the DMA through February 24. The exhibition reveals the forgotten O’Keeffe’s life and work and features the artist’s personal scrapbook documenting her career. “I wanted to introduce people to Ida herself as an individual because basically she has served for all these years as context for Georgia’s story,” Canterbury said. The DMA is the first venue of the exhibition’s national tour. A seven-minute film outlines O’Keeffe life, career and strained relationship with her famous sister. Born in 1889, O’Keeffe had four sisters and two brothers. Only two years younger than Georgia O’Keeffe, the sisters were close. Georgia O’Keeffe met and eventually married Alfred Stieglitz, a photographer and art promoter responsible for supporting and publicizing his wife’s work. The younger O’Keeffe never married, taught drawing and became a nurse. The exhibition picks up in the 1920s when the O’Keeffe sisters and Stieglitz spent time at Lake George. Stieglitz’s snapshots of the sisters show a playful, happy time while letters reveal Stieglitz’s infatuation with his sister-in-law. “He flirted constantly with Ida: little notes, pinches and slaps on the behind. For her, the way she handled it was she gave as good as she got. She’d pinch him back and Georgia was amused by it all because of the way she handled it,” Canterbury said. Artistic ambitions divided the sisters. Ida O’Keeffe began painting in 1925. After receiving favorable reviews from an exhibition, she decided to pursue a formal education, earning an MFA from Columbia in 1932. Another sister, Catherine, also began painting and when the sisters received attention, Georgia O’Keeffe protested. “I think a key thing to point out is that the way the galleries and the newspapers were saying, ‘Oh, another O’Keeffe emerges!’,” Canterbury said. “They were casting this whole thing as a sisterhood of the brush and Georgia didn’t want to be part of a trio. Catherine gave up painting all together, but Ida resisted.” Georgia and Ida O’Keeffe remained estranged for the rest of their lives. At the heart of the exhibition is O’Keeffe’s series of paintings inspired by a Cape Cod lighthouse. O’Keeffe employs dynamic symmetry, a compositional concept linking art and mathematics, to develop variations through seven paintings. The exhibition includes six of the seven pieces. The first painting in the series has not been found, but Canterbury has a suspicion about its appearance and its relationship to the rest of the series. Lacking support from her artistically connected sister and struggling financially during the Great Depression, O’Keeffe held several short-term teaching jobs around the country. In ten years, she moved 13 times. She lacked studio space, time and resources to consistently develop her work. O’Keeffe discovered monotype was the ideal medium for her circumstances. “Working in black and white at night with not the best lighting sources, she really did beautiful things with monotypes. These are incredibly beautiful and poetic, especially these landscapes,” Canterbury said. While teaching in San Antonio in 1938, O’Keeffe painted “Star Gazing in Texas.” The painting is displayed in its original frame O’Keeffe decorated with cut-out tin stars and press-applied stars. “She creates this really great moment of this woman standing on this promontory with this expansive Texas landscape beyond her and she’s looking at the stars, not in the painting, but on the frame,” Canterbury said. 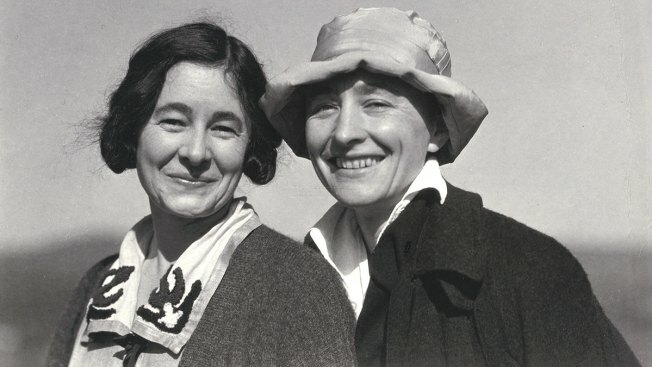 Canterbury argues Stieglitz’s extraordinary support of Georgia O’Keeffe is the deciding difference between the sisters’ success. “We need be aware that 99.99 percent of women in this period basically did not have gallery representation or exhibition venues. They had to create their own exhibition venues by forming organizations like the National Association of Women Painters and Sculptors, so they could exhibit amongst themselves,” she said. This exhibition is a tale of two sisters, pondering what might have been and adding a new chapter to the canon of art history.